Last Tuesday (10 days ago), after moving a washing machine in the flat above Tuffet's, Tim was just tidying up, when he tore a massive amount of muscles in his back. He managed to get home, but spent the next 4 days unable to stand up. He is still pretty much housebound, and has now managed to walk to the end of his road and back. But essentially, Tim's back is pretty fucked at the moment and he can't work at the shop. Heroically, he's been sitting/lying (I don't know), at home doing our monthly accounts and making sure that we don't get told off by our suppliers for not paying our bills on time. I've been at Tuffet's pretty much non stop for the last fortnight. I've been desperate to get down to Wood Green, because there's so so much to do down there. I did spend a day at the Big Green on Monday (we had to shut Tuffet's) and did a bit of tidying. Blah. As I've mentioned on a previous post, things are a bit quiet at the moment at the shop. Tim and I have been putting a lot of effort into opening the new gaff and I suspect taking some of our energy away from Wood Green has meant that it's not the slick, well oiled machine it usually is *coughs*. Less people have decided to come and visit us there. That's what happens (we knew this), and we'd been really looking forward to Carmel starting, so that we'd then be able to have some time to look at the massive list of stuff we'd had to put on hold whilst trying to sort out the new shop. 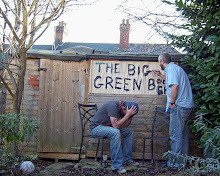 Despite Tim knackering himself, we're can't put it off any longer, so we're going to be throwing all our energy at getting Big Green buzzing again (not with flies), and Literary Festival plans are the main focus of the next few weeks. All the regular stuff is still going to be happening , including our Comedy Night tonight, school visits next week, book groups, writing groups etc.and we'll also be selling books at "The Literary Conference" at the Free Word Centre next weekend. Anyway, we've always tried to be honest on this blog before, so we just thought we should let you know about poor Timmy and how how things are. 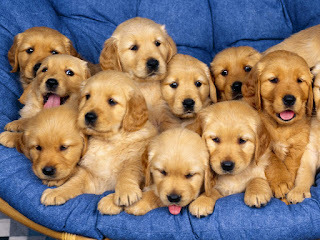 Here's a picture of some puppies. A few months ago I wrote a blogpost asking Independent Bookshops to band together in order for us to see if we could get a better deal on e-books than we are currently getting. It was relatively successful and we had around 15 Indies get in touch to express an interest. Not bad. The trouble was that we are all very busy, trying to survive and thrive, so the opportunity to get together and chat regularly wasn't possible. However, this doesn't mean that we gave up. Oh no. Some wonderful groundwork was put in by Nigel French, owner of Cole's Bookshop in Bicester. He's been in touch with a company in Australia called "ReadCloud", who supply over 100 Indie bookshops down under with a platform to sell e-books. They're keen to work with us over in the UK too. It looks rather good too. So, here's the deal. They need around 50 shops to sign up in the UK to make it possible. If they get 50 shops, the set up cost will be approx £950 (it's likely to be less if more indies join). There will then be an annual charge of £450ish after that. Phew, £950 sounds like a lot of money. But we broke this down into sales. That's about £3 a day. If you sell ONE e-book for £8.99, you've made more than that. We have customers who buy both physical books and also downloads. I'd like to think that if we sold downloads, then some of those customers would buy them from us. I realise the timing of this isn't great, but please get in touch with me or Nigel if you're interested or have any questions. We've already had a few indies expressing an interest, including Bob from the mighty Gutter Bookshop in Dublin. He knows a good thing when he sees one. Please share this with anyone who you think may be interested. If there was such a thing as a combined Independent Bookshop/Record Shop Voucher, which was accepted in 90% of Indie Bookshops and Record Shops in the UK would you be inclined to buy them more than a National Book Voucher or a Record Voucher? It's been a while since I wrote one of these here blogposts. Let's see if I can still do it. 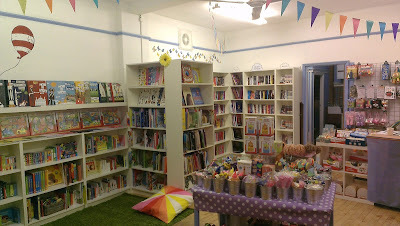 OK, we've opened Tuffet's Toys and Tales, our new little Bookshop/Toyshop in Brookmans Park. Brookmans Park is a lovely little village and we've had a very positive response so far from the community. Obviously, it's still very early days, but we are slowly building up a little customer base. I've been in touch with all the local schools, letting them know we exist etc, and seeing what it is they want from a local bookshop. I've had a meeting with one already and have arranged another meeting with another just after half term. The Big Green Bookshop is quiet at the moment. Very quiet. Since we got the keys to the new shop, all the effort to open it and set it up has meant that we haven't spent as much time as we'd like on the good ship Big Green. This, among other reasons has meant that we've had a lot fewer people through the door. But with a bit of luck, a succession of 16 hour days, no holidays and a tailbreeze, we can turn this around. Over the last couple of weeks we've been interviewing candidates for a job at the bookshop. And i'm delighted to say that Carmel, for this is the name of our newest member of staff, has started today! She'll be based mainly in Wood Green, but will also work up in Brookmans Park once a week. Carmel's role is essentially to look after the day to day running of the Big Green Bookshop.We want her to look at the place with a fresh pair of eyes and introduce new and exciting initiatives at the shop as well as revisiting the layout and general look and feel of the place. Tim and I are aware it looks a bit tired at the moment, so it's reassuring that Carmel will be there to breathe new life into the place. No pressure Carmel. Work has started on the Literary Festival and in the next couple of weeks, we'll be able to give you a much more complete idea of how things are progressing. Suffice to say we are freakishly excited about it all. Now that Carmel has started, I can now revisit a few of the other projects I've put on hold since the new year. It also means I can update the website more often, book some great new events, write more blogposts and generally be a lot more noisy about the bookshop than I have been. Next week, it's our Big Green Bookswap, with the magical Matt Haig and Andrew J Lambie. (TICKETS HERE). I am particularly excited about this, for a couple o reasons. Firstly, Matt Haig is a brilliant writer, who I've been meaning to get to do an event at the bookshop for ages. And secondly, Andrew J Lambie has written a novel that made me go "ooh, blimey, this is good. Better than good actually". It's called Carnival of the Flesh . I'm going to try and embed a video on here now, of Andrew reading the first chapter. Let's see if I can do it. It's a very enjoyable 8 minutes long. Anyway, there. I've written a blogpost. I enjoyed it. I think i'll do it again tomorrow.